Online For $99 Website Special! You may fend for yourself out on the web, or you may still contact us for web work. We are available to do maintenance, repairs, additions (we sound like we are in the construction business), at our usual low service rate of $85.00/hr, billable by the minute, meaning if we do 17 minutes of work, we bill you for17 minutes). So, if you find that web work really isn't your cup of tea, or you run into issues, we are still here and available to assist you. Ready to get started? 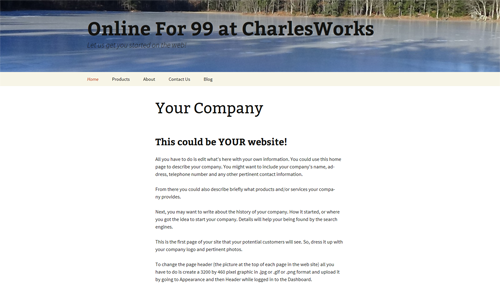 Call us at 603-924-9867 or email us at Websites@CharlesWorks.com! It's Thursday, April 18, 2019 at 11:28 pm in Peterborough, New Hampshire, USA. There are 122 guests browsing here with you!